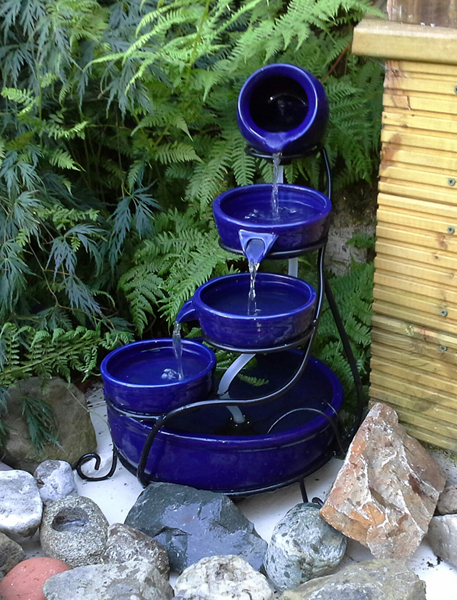 Bring an element of traditional style to your garden with the Blue Ceramic Solar Cascade - a popular variation of the traditional terracotta cascade fountain. Relax to the sound of water gently cascading down the four tiers, creating a calm and peaceful atmosphere. The high quality, glazed ceramic finish of this sleek water feature greatly adds to its overall effect and will surely make a great addition to your garden. Please Note: The pump will run for 3 hour every day and then turns itself off until the next day at the same time. If you wish to restart it sooner than this, just press on and off and the water feature will reset itself. Genuine terracotta manufacture - not a polyresin plastic imitation! Mains adaptor (optional) includes 160cm (63") of cable. Manufactured from genuine terracotta, this lovely water feature is lightweight and allows for easy portability. Its classic design features a glazed blue colour and consists of a pot and three small dishes placed on a wire rack that support each bowl. The water is pumped up to the top dish and then slowly cascades through the water feature before collecting at the base, ready to start the cycle again. Watch the water serenely pour out of the top bowl before cascading into the tiers below. It creates a wonderful, soothing display that is sure to add a sense of tranquillity to your surroundings. Powered by a solar panel and pump, it is totally self-contained and requires no wiring. Using photovalvic solar cell technology, sunlight is converted into electricity to power the water feature. Solar powered water features allow you to enjoy all the benefits of a water feature without the need for mains power. This 8.4V DC mains adapter and converter cable will allow you to enjoy your solar cascade even when the sun isn't shining. Thanks to Ms J for this photo of this water feature in her garden. "You're service was fantastic, the water feature great value." "Light has never worked and now the pump will only stop when disconnected or runs out of power"
"The gift recipient loves it -"
"Packed very well and put together in no time and is working fine." "Not to big good value for the money"
"The Top jug needs to be bigger as s it only just feeds the on below without spilling, also the pipe from the pumpto the jug is not long enough and not flexible , I had to replace it with a longer one so that the pump could sit in the bottom"
"Impressive and value for money." "Lovely and just the perfect size for our terrace"
"The water feature looks lovely"
"Easy to assemble and position. The only downsides are using hard water leaves a lime scale mark on the dark blue porcelaine and in this hot sunny weather algae tends to form quickly in the bottom bowl."